– Step 1: Coconut you buy at the market you can say the seller grind and squeeze the core is always convenient. If not, can be replaced with canned coconut milk. – Step 2: Add 1.5 liters of water to the sugar, continue to add coconut milk, then put the package of plasticizer, sprinkle two more vanilla and cocoa powder. Stir in the mix, stirring and stirring until boiling. – Step 3: After the mixture is boiling, turn off the stove, put into the molding as you like. To stay outside for about 15p to plasticizer, put in refrigerator cooler and use when cold will taste better. Remove the veggies from the mold and place them on a plate. It is suitable for desserts served to guests at any time. 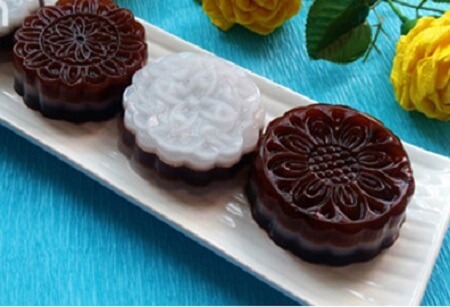 The jelly cocoa is a delicious and cool dessert in the summer and is one of the most popular desserts. Can be chopped together with milk tea, sweet fat milk tea together with the bitter taste of cocoa will give you a great drink.